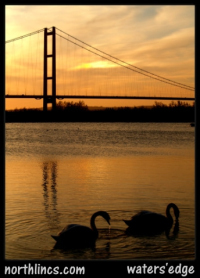 Barton-upon-Humber lies in the shadow of the magnificent Humber Bridge which spans the River Humber to Hessle. Barton boasts many impressive & historic buildings which can be seen as you wander through the town. Barton is still a vibrant town with a traditional shopping area & a thriving waterfront which includes the Barton Clay Pits, Far Ings Nature Reserve & the new Watersedge Nature Reserve which cover 5 miles of coastline to the north of the town. If you like the outdoors then Barton is a perfect place to visit, ideal for Walkers, Ramblers, Watersport Enthusiasts, Anglers & those with a keen interest in Wildlife.